Hellboy will rise once more. Comic book artist Mike Mignola has announced that his demonic hero turned movie star Hellboy is getting a shiny new reboot, this time without original director Guillermo del Toro at the helm. Mignola broke the news on his Facebook page, revealing that, despite past chatter, there will be another Hellboy flick coming sometime in the future. The project will be an R-rated reboot, according to Mignola, and has already tapped a director to lead and an actor to portray the eponymous character. Neil Marshall, celebrated for his directorial break-out film The Descent and for his work on HBO's Game of Thrones, will take the reins for the refresh. Stranger Things star David Harbour is slated to play Hellboy. Harbour will replace Ron Perlman as the bright red, cigar-loving devil. According to The Hollywood Reporter, Millennium is in talks with producers Larry Gordon and Lloyd Levin for the reboot, which is intended to relaunch the Hellboy property. Dark Horse Entertainment's Mike Richardson is also set to produce. 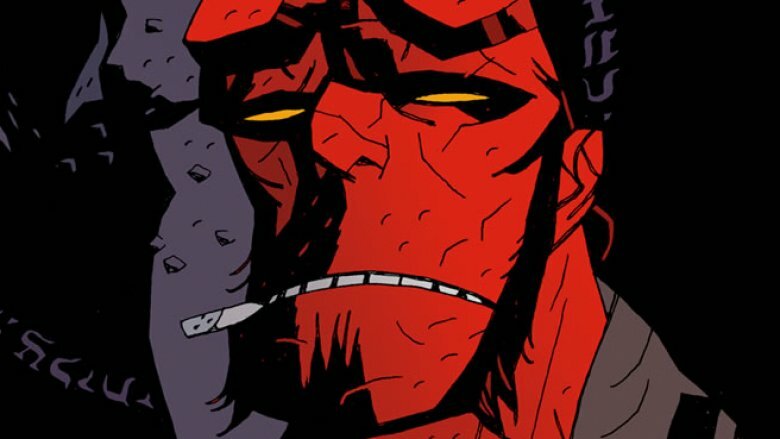 Mignola's announcement follows shortly after del Toro's admission that Hellboy 3 would never come to fruition. In a post on Twitter, del Toro wrote that, after speaking with all parties involved in the franchise, "the sequel will not happen." Immediately after, del Toro preemptively shut down further conversation on additional Hellboy movies, stating, "That is to be the final thing about it." It certainly appears Mignola has opened the door del Toro may have intended to keep closed. Hellboy, created by Mignola in 1993, quickly became an indie comic icon, largely due to his unique background. He's a demon brought up by a professor, who fights hordes of bad guys while working for a unit known as the Bureau for Paranormal Research and Defense. Tons of comic fans dug it, and Hellboy's long-standing success proves it. Del Toro brought the first Hellboy movie, which he co-wrote and directed, to the silver screen in 2004. The second installment, Hellboy II: The Golden Army, was released four years later, and went up against some serious competition. Fans poured in to see the Christopher Nolan-directed, Heath Ledger-led The Dark Knight just six days after the Hellboy sequel's debut. With Marshall and Harbour behind the wheel, perhaps the more mature Hellboy reboot will see brighter box office days. Though Mignola didn't reveal any additional details about the new Hellboy film, he did promise that "more news [will] come soon." While we wait to find out just how soon "soon" really is, find out how the original Hellboy cast should really look. Perhaps Harbour will embody the devilish hero's aesthetic more than Perlman did.